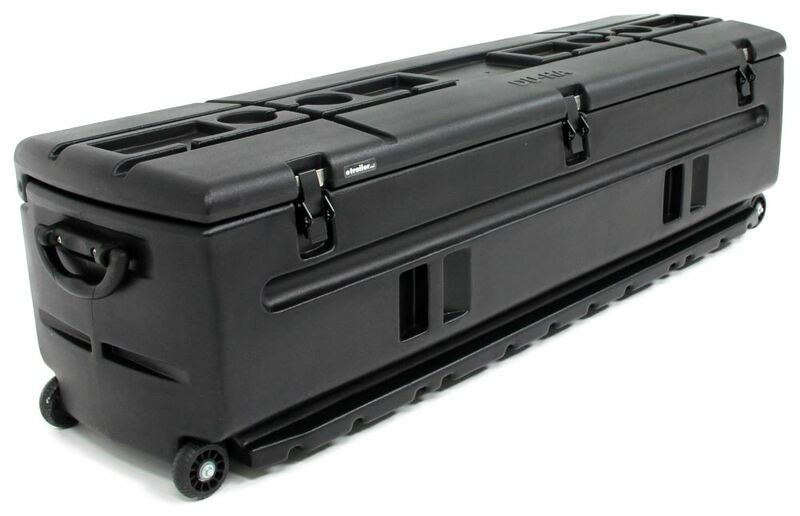 This portable storage container with wheels holds shotguns, tools, gear, and more. The mounting bracket lets the tote slide in and out of your pickup truck bed or SUV so you can easily access your gear. Gun rack and 2 utility trays included. 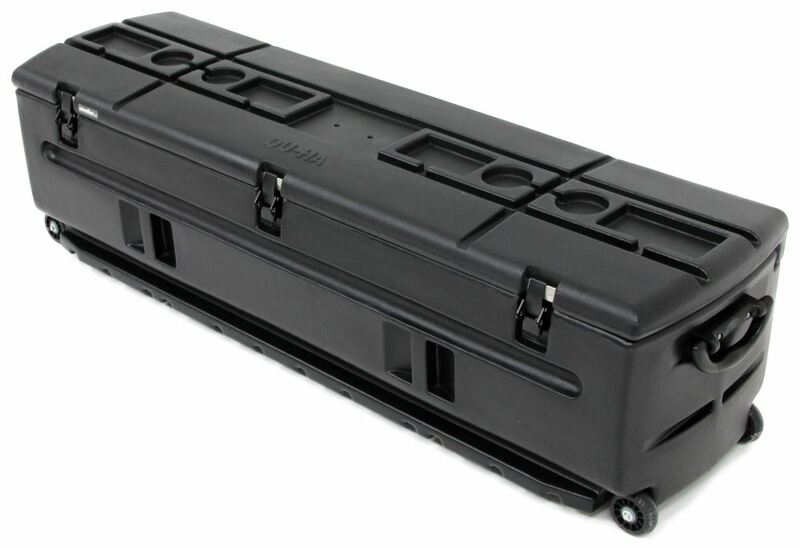 Lowest Prices for the best vehicle organizer from Du-Ha. Du-Ha Tote Wheeled Storage Container with Mounting Bracket for Trucks and SUVs part number DU70114 can be ordered online at etrailer.com or call 800-298-8924 for expert service. 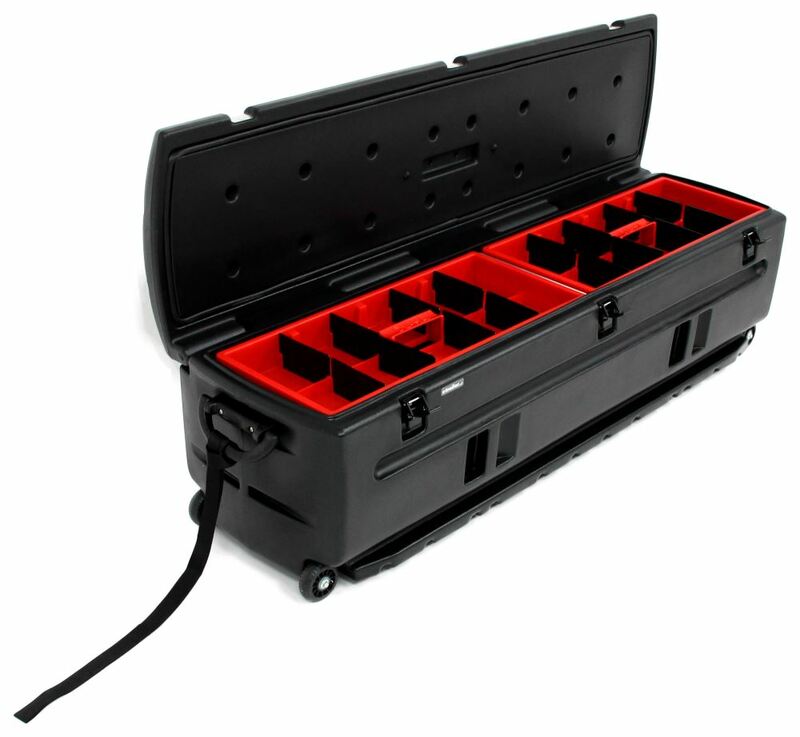 This portable storage container with wheels holds shotguns, tools, gear, and more. 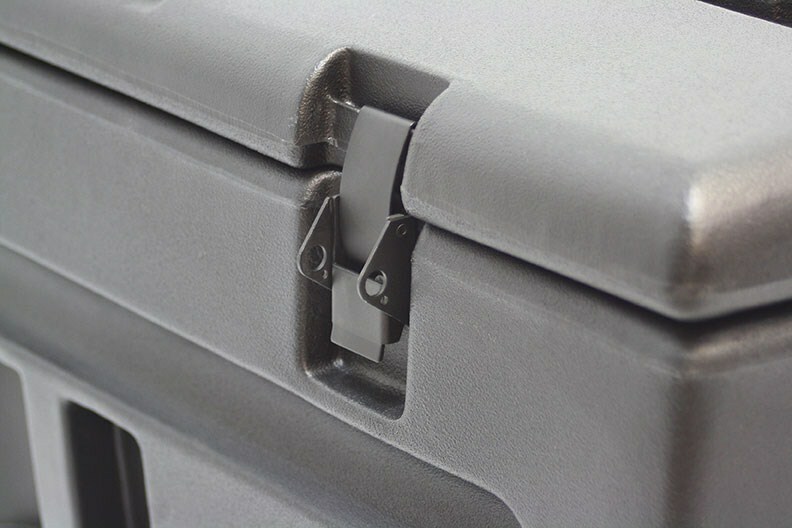 The mounting bracket lets the tote slide in and out of your pickup truck bed or SUV so you can easily access your gear. Gun rack and 2 utility trays included. 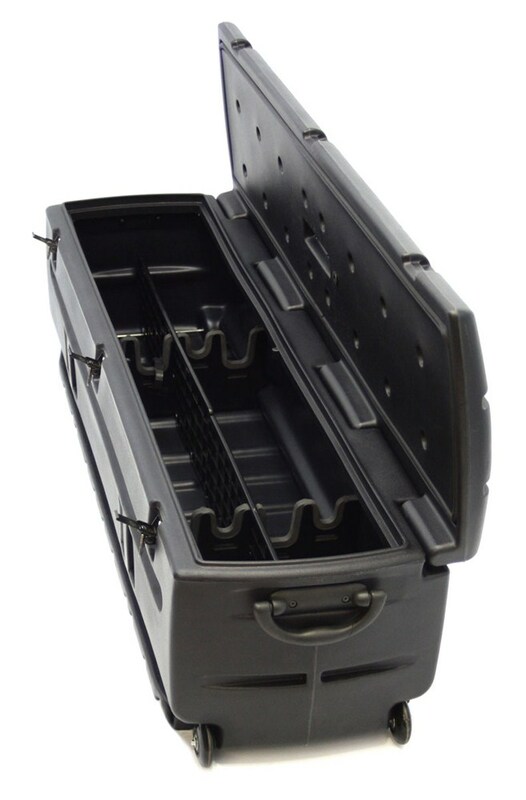 This spacious storage container can be used as a toolbox, gun case, or even a bench for sitting around the campfire. Store your tools, camping supplies, food, guns, and more. It's made of heavy-duty polyethylene with a rubber gasket that runs all the way around the inside of the lid to help prevent dirt and moisture from getting inside. It also has rain channels in the lid to help keep liquid from pooling on top of the container. It also includes a bracket so you can mount the container in your truck or SUV. There are tracks built into the bracket that let you slide the container in and out of your vehicle for easy access to your cargo. The portable tote fits neatly in your truck bed or in the back of your SUV. You can store and organize your cargo, then pull out the tote and wheel it to the construction site, camping area, or hunting ground. 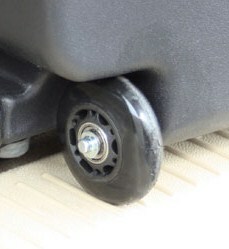 Durable wheels on each corner make the tote easy to maneuver. The handles on the lid and sides help you lift the tote in and out of your vehicle. You can also attach the included pull strap to one of the handles at either end of the tote so you can roll it behind you. You can add a padlock (sold separately) to 1 or all 3 of the steel latches on the front of the tote to help prevent theft. Up to 3 totes can fit side by side in most full-size trucks and SUVs, giving you additional space to carry your gear. 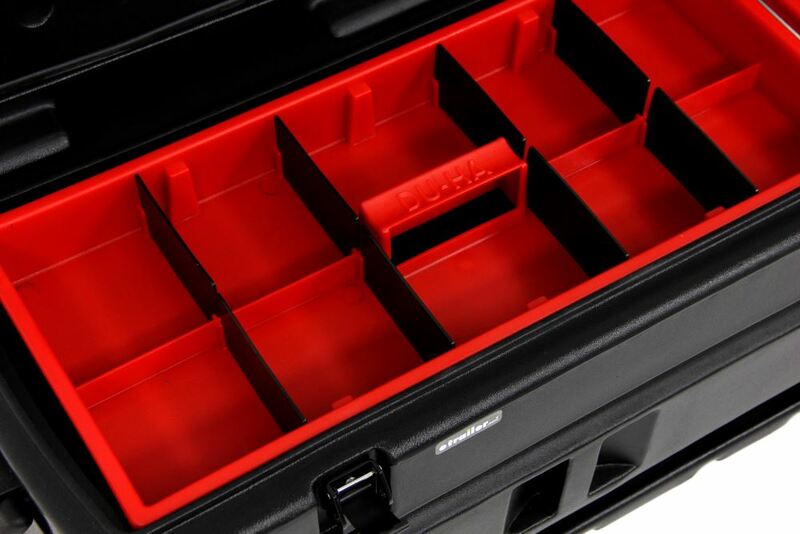 You can pack large tools and equipment in the lower storage compartment, and organize smaller items in the 2 removable trays at the top of the tote. Each tray has dividers so you can customize it for your needs. 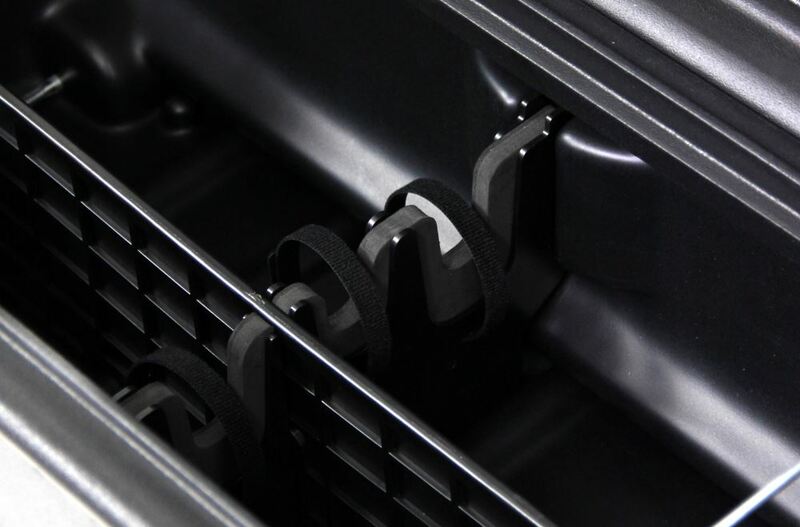 Built-in handles let you easily remove the trays to reach the items stored underneath, or carry them with you. The soft foam holders won't scratch your guns. The stock of your gun rests in the large groove, and the barrel sits in the smaller notch. 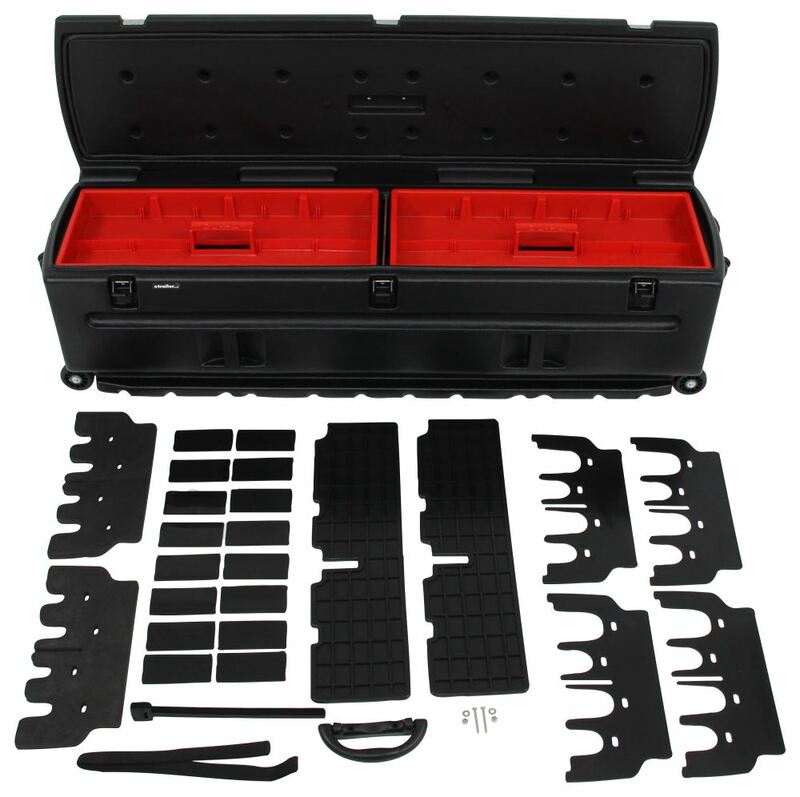 To set up the gun rack, assemble the holders by connecting 2 plastic stiffeners around each foam holder. Then slide these assemblies into the slots inside the tote. 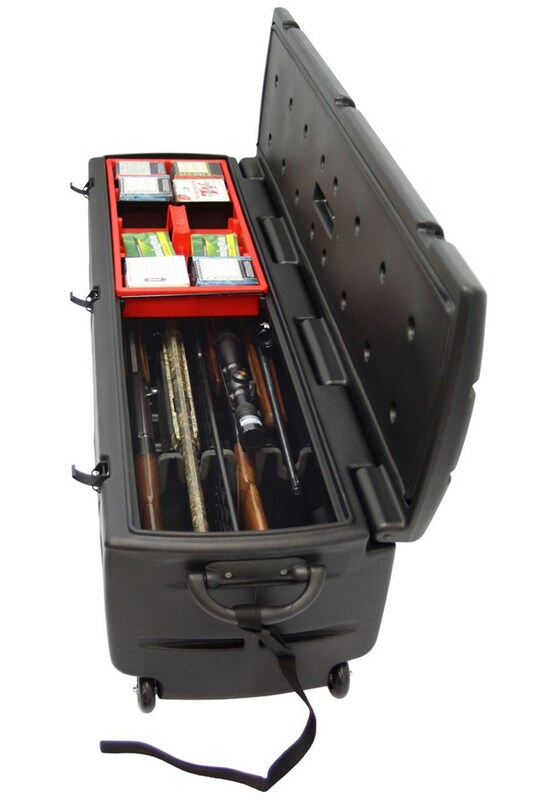 Place your guns in the assembled holders and secure them to the gun rack using the included hook-and-loop straps. 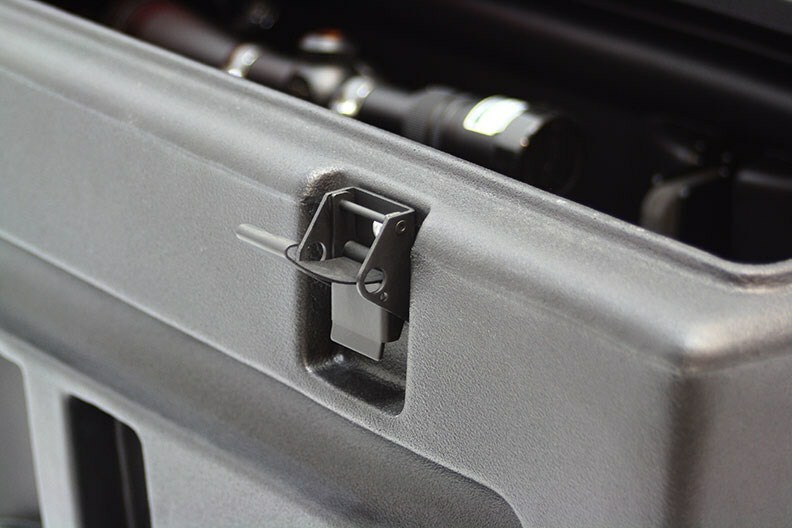 The straps will secure your firearms in the holders so they won't bounce around if your vehicle hits a bump. You can also store your camping supplies and food inside the tote, then close the lid and use it as a bench at your campsite. There are 4 cup holders molded into the lid to hold your drinks. The heavy-duty aluminum bracket bolts to your truck bed, or to the floor of your SUV so that when you slide the tote into place it will remain stationary as you drive. Some drilling is required for installation. It includes 4 feet that can be added to the underside of the mounting bracket. The feet let you adjust the height of the bracket so that the tote clears the lip at the rear of your truck or SUV. The lock swivel attachment included with this bracket screws onto the tote, and the latch on the bracket snaps over the lock swivel to hold the tote in place. To secure the tote simply turn the eye on the lock swivel so that the latch won't slide off. 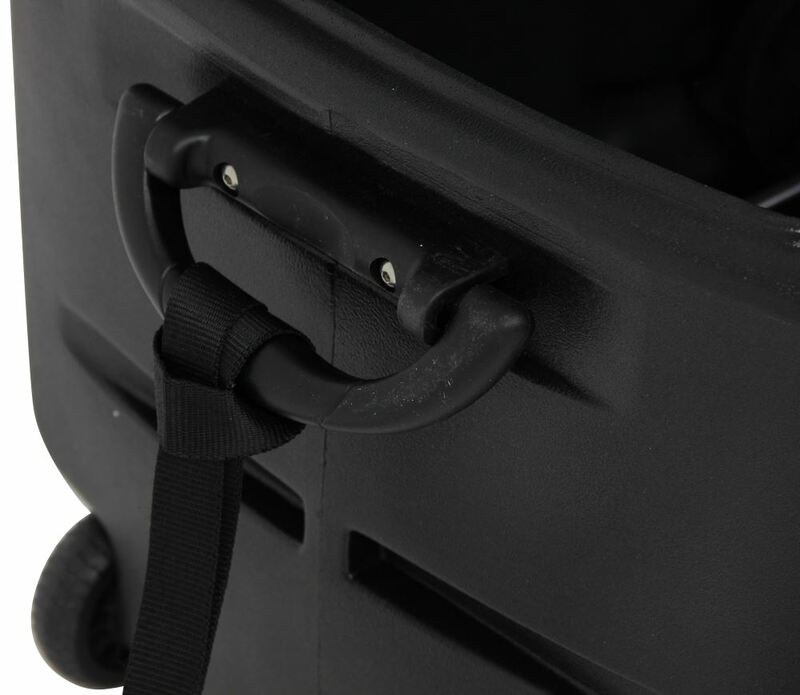 You can insert a padlock (sold separately) through the eye to lock your tote to the bracket. 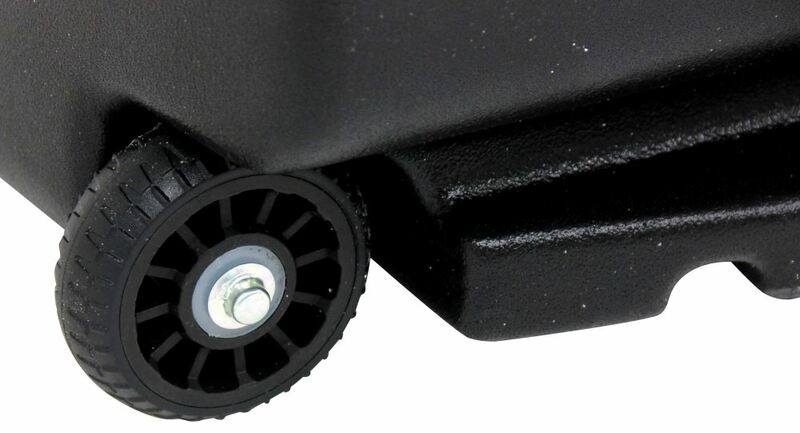 The track on the bracket allows you to slide the tote in and out of your vehicle for easy access to your cargo. It is strong enough to support the tote when it's partially pulled out so that you don't have to remove it entirely to access the contents. When you want to unload the tote from your vehicle, just slide it all the way out of the track. Rampage Trail Can Locking Storage Box w Single Compartment - Steel - 13" x 18" x 6"
Do you have a question about this Vehicle Organizer? 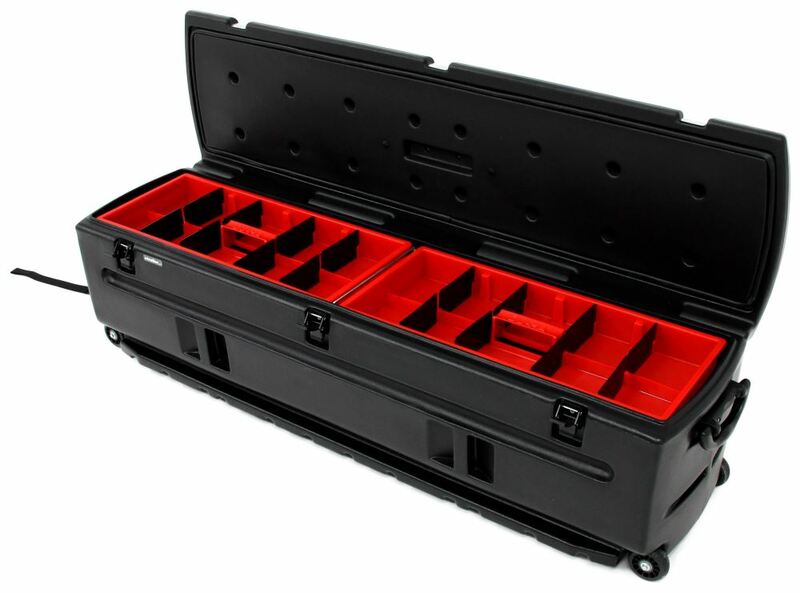 Highest quality vehicle organizer for the best price. Most detailed, accurate vehicle organizer information available.